Halloween is really, almost over…two hours to go and nobody has rung the doorbell for at least 30 minutes. So, Happy Halloween to all you spooks out in the world. I’m not sure what it is about Halloween these days that make it the second most populous holiday as far as consumer spending but I sure would like to know. I mean really, isn’t the world scary enough without having to emphasize it all the more? Between my 401K tanking, the rising cost of living, deciding what to fix for dinner, and driving on the 408 and I-4 everyday, I’m spooked enough. Every morning I look in the mirror and worry that a zombie will be staring back due to my lack of sleep thanks to our animals keeping us up through the night. Perhaps Halloween gives people a chance to actually BE scary on purpose. Last Friday night, I went with my daughter to get a Halloween costume. We walked in to the Halloween Spirit store and much to my surprise in the abandoned K-Mart space was wall-to-wall costumes, make-up, decorations, and more. Seeing that the line to try on costumes was like being at a theme park I told my daughter, “I’ll wait in line while you find a costume.” Moments later, she came back. She got in that line and for me, I was off to wait in the line to pay. While in line, I walked past a Frankenstein that came to life when a button was pushed and then, there it was…Regan from the Exorcist. WOW, that brought back some memories. I couldn’t help myself, I pushed the button. Well, some strange noise came out of the machine and then Regan’s head spun all the way around. Pretty cool, but I was waiting for it to vomit pea soup or something as it did cost $200. Nope, just the head spinning around. Bummer. Next was watching the crowd. Talk about scary. Some of these people needed nothing as their everyday attire, attitude and general being were all pretty frightening. And, talk about spending money…the lady behind me was ready to lay down nearly $500 for costumes for her kids and some decorations. I’m thinking, how can people afford this stuff? And, if they have that kind of money, why the heck are they spending it on THIS stuff? Cheaply made costumes, overrated and overpriced decorations. I mean, come on….Regan doesn’t, repeat DOESN’T vomit pea soup! For $200, I want pea soup. Now, I like a good time like many people. Parties, neighborhood get-togethers, and all that. When I was a kid, seems like we got creative with our costumes and decorations. What ever happened to that sense of inspirational genius? Making a coffin out of a refrigerator box, actually carving pumpkins, dressing up as a hobo, clown, princess, angel, etc. without having to go out and spend a fortune? I loved going out trick-or-treating. 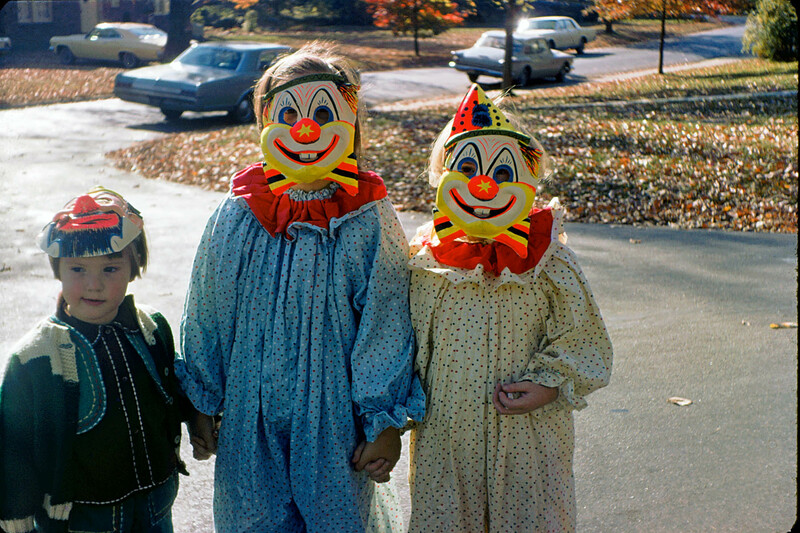 Like many, my siblings and I would head out with the parents and go to the neighbors we knew. It was “ok” because we weren’t getting candy from strangers. Heck, we got homemade popcorn balls and other treats…no worries about razors, poison apples, or strange things. What I think is a little funny is all the churches that sell pumpkins and have “fall harvest festivals” and then have “trunk or treat” events in the parking lot. For a Pagan holiday, it sure is getting the attention of the church. I’m glad my daughter is grown up now. At lunch people were talking about sexual predators and saying “have you done a predator check for your area?” Jeez, frighten me some more. I know, it is a serious subject and knowing they live around the area on Halloween AND every day of the year is a little un-nerving. Doomed I tell you, doomed. If Halloween weren’t scary enough, the chocolate is calling…. This entry was posted in Uncategorized and tagged Candy, Costumes, Trick-or-Treating. Hi Val, Great picture of you and great story too! Hi Val, I think I asked you this already, but which one is you in the picture?